Amber and her husband are strangers living together, raising four kids. He owns a successful business and she’s a stay-at-home mother. He never wanted children and she did; so, he has a “hands off” approach with the kids. They don’t talk much. They haven’t connected physically in years. They don’t say, “I love you,” or kiss goodnight. They literally go days without looking at one another in the eyes. Amber has to take a sleeping pill every night in order to get to sleep and she’s always exhausted. She is on both anti-depressants and anti-anxiety medicine. She no longer goes out with friends or maintains friendships because she doesn’t want to have to answer questions about her marriage. When we met, she told me she felt numb and empty and alone. The thing that has kept Amber in this painful marriage for 16 years is that she doesn’t have a good-enough reason to leave. Her husband isn’t a bad guy. He doesn’t hit her, yell at her or manipulate her. He doesn’t lie to her or cheat on her. And in her mind, her unhappiness alone isn’t enough of a reason to leave. To leave her marriage – without judgement – she needs a good reason; one that other people will look at and agree with. Not one based on the fact she simply wasn’t happy. Somewhere along the way we got this idea that our happiness isn’t important. It’s more important to make those around us feel comfortable than for us to be happy. It’s more important for us to have the approval of family and friends than it is to live a joy-filled life. It boils down to this false belief: It’s more important to keep the peace than to be happy. I don’t think Amber came into this world to live a numb, lonely and empty life. I don’t think her soul came here only to do whatever everyone else around her needed her to do. I don’t think that anyone’s going to build a monument to her and her utter selflessness after she passes. And I don’t think that’s what you came into this world to do either. Being happy is your primary job in this life. 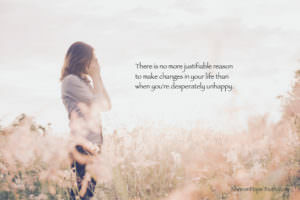 There is no more justifiable reason to make changes in your life than when you’re desperately unhappy. Changes don’t have to mean blowing up your life or your marriage. It can be changes in the way you think, how you interact and connect with your husband and others. It might be changes in the self-loving boundaries you set, or changes in how you feel about who you are. It can mean putting you and your happiness first, knowing your worth it by simply being here. It can also be lovingly leaving toxic relationships. To your true happiness. It’s time to find it (and actually live in it).